OKLAHOMA CITY (Jan. 26, 2017) – More than 1,000 Oklahoma students from lower-income families are now able to attend private school thanks to a tax-credit scholarship program. 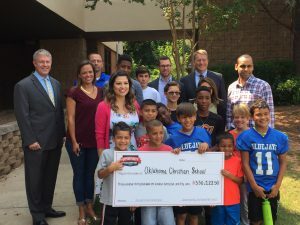 The Opportunity Scholarship Fund (OSF), a scholarship granting organization for Oklahoma K-12 students, raised $5.1 million in donations last year. This was a 50 percent increase from the $3.4 million raised in 2016. “If it wasn’t for OSF, our children wouldn’t have access to better education in a school that matches our needs,” said Danielle Marie, a parent at Oklahoma Christian School (OCS) and OSF scholarship recipient. Four of Marie’s children use these scholarships to attend OCS in Edmond. The record number of donations allows even more low-income students to attend an accredited private school that better fits their individual learning needs, including children with autism, hearing impairments or other special education needs. “Through the generosity of our donors, we are able to change the lives of thousands of Oklahoma kids,” said OSF President Charlie Daniels. Learn more about OSF scholarships or how to donate at www.osfkids.org.